Welcome to the Richland Area Chamber! For more than a century, the Richland Area Chamber of Commerce has supported economic development throughout the Mansfield, OH and Richland County area and offered valuable benefits to its membership. The Chamber is a member-based organization, and area businesses and organizations are invited to learn about joining our efforts. Membership is a win-win situation. We rely on the support of our members to continue our efforts in economic development, business advocacy and membership services, thereby supporting and improving your business. As an added bonus, the Chamber provides quality services that give each of our 1,000+ members a competitive advantage! When members take advantage of the numerous value-added benefits that Chamber membership provides, their membership is often paid for many times over! Enhance the value of our communities as places to live, work and invest. Just once month after the Chamber’s incorporation August 22, 1899, it scored its first industrial victory by convincing the Bell Watch Case Works to Mansfield, OH. In 1907, Chamber president H.L. Reed founded a department store, which became Mansfield’s oldest and largest retail establishment. In the 1950’s Mansfield attracted such businesses as Stone Container Corporation of Chicago, Convey-All-Metal Products, Case and Maul Manufacturing, Therm-O-Disc, and General Motors. The Chamber soon began expanding its sights beyond the downtown and officially changed its name to the Mansfield Area Chamber of Commerce in August 5, 1959. On May 8, 1973, the Mansfield Area Chamber of Commerce was officially recognized as a fully accredited Chamber of the United States. On March of 1974, the Chamber celebrated 75 years of service with a Diamond Anniversary Dinner. On August 25, 1975, the Chamber became the Mansfield-Richland Area Chamber of Commerce. In 1992, the Chamber entered into agreement with the Greater Cleveland Growth Association and Council of Small Enterprises (COSE) to offer cost-effective group health insurance to small businesses through Medical Mutual of Ohio. Over the years, this has proven to be one of the most valuable benefits of belonging to the Chamber. In January, 1999, the Chamber celebrated its 100th anniversary during its Annual Meeting and Dinner at the Holiday Inn, followed by a sold-out concert featuring the Coasters, Drifters, and Platters at the Renaissance Theatre. In 2011, the Chamber once again expanded its sphere of influence as it became the Richland Area Chamber of Commerce. 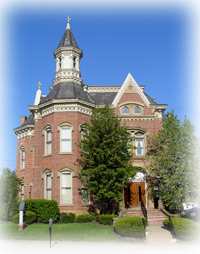 The Richland Area Chamber of Commerce building was built in 1890 to serve as the home and medical office for Dr. James Woods Craig, a staunch Republican who was active in the United Presbyterian Church and Ancient Free and Accepted Masons. The home was built on a sandstone foundation with hand made bricks. Another little known fact is the home was designed by prominent Cleveland architect, Levi Scofield, who also crafted the Ohio State Reformatory which opened in 1896. Craig had purchased the property from Hattie A. Booth in 1885 for $15,000. At that time, the site was on the edge of town, with Weldon Avenue being the city limit. The woodwork was milled locally from oak, cherry, and walnut; the main door was inlaid with curly maple. The Chamber began a search for new headquarters in November 1974 and, in May 1977, the current property (described above) at 55 North Mulberry Street, Mansfield, OH was purchased. Renovation was completed in 1978. In 2001, work began on more extensive renovations to restore much of the building to its original beauty. A new slate roof was laid down, masonry work was completed, painting was done and windows were repaired. The Chamber building stands today as a symbol of our organization’s heritage, portraying the same strength, stability and integrity that our Chamber of Commerce has stood for since August 22, 1899.